Woke to sound of seagulls and the tang of salt air, that’ll stop me from leaving my bedroom window open! Day 3 another mammoth day in the saddle. I was feeling of trepidation as i waved a find farewell to lovely faded Llandudno , as i hadn’t arranged a B&B for the end of today’s adventure (as I wasn’t sure how far I would get). The coastal cycle path quickly disappeared into a series of sand dunes and I was seriously considering turning back for the main road, nevertheless I fastened a tea towel to my head put on my best Peter O’Toole/Lawrence of Arabian face and dragged my bike through the sandy wastes. Oh, what a reward awaits those with enough gumption to undertake this trek, the cycle path soon re-emerged from beneath the sands and across the bay stands the imposing fortress of Conwy. 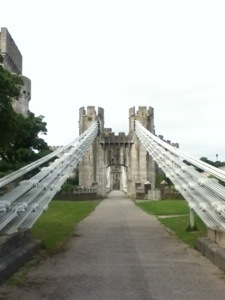 As you ride across the bridge the castle looms above you imposing Norman might on the lawless. The ride from Conwy to Bangor is fantastic, following the cycle path 5 you hug the coastline for most of the journey flanked by the mountains and the sea. 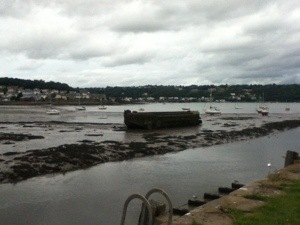 After a woodland descent a found myself at my first port of call Bangor, home of the Gwynedd Archaeological Trust. 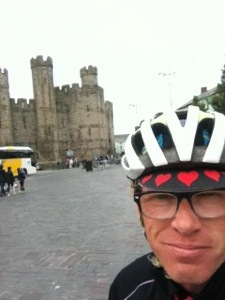 After coffee, cake (thank you Emily) more coffee, bike lubricant and a photo shoot, I bid a farewell to my North Wales colleagues and pointed my wheels in the direction of another Norman Castle, the mighty Caernarfon! The castle was one of a series built by Edward I to intimidate the surrounding population. The colour banded walls were designed to echo Constantinople, the imperial power of Rome. By the time I got there however the phone battery was on its last legs and after been informed that I couldn’t recharge my phone in the coffee shop I had to take the decision to turn it off or let it die. Die it was. I joined the vast hoards of tourists all taking ‘selfies’ in front of the castle and headed to the Lôn Eifion trail. 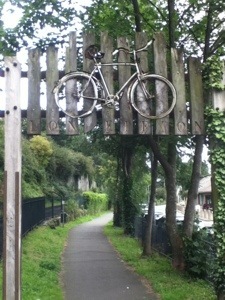 This cycle path runs from Caernarfon to Bryncir along a former rail line. By now the weather had started to turn and the blue skies that had followed me from Llandudno deserted me as bands of slate grey rain rolled down the Snowdonia mountains to soak me. 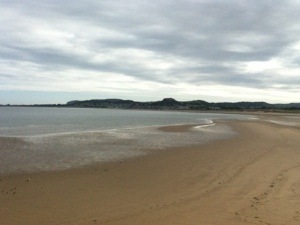 By the time I got to Criccieth, I knew I was in trouble. My knee had swallow like a balloon and it was becoming uncomfortable to ride, nevertheless, Barmouth wasn’t to far away, just another 2 hours cycle. Over the toll bridge at Porthmadog, past Harlech and the end was in sight. What is it they say about the plans of mice and men? 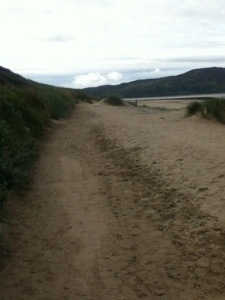 No rooms at Barmouth!! My world suddenly became myopic as I knew I had carry on. No rooms at Machynlleth! 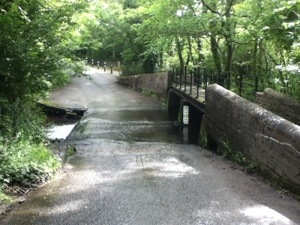 With the pain in my knee being unbearable the cycle along the A487 became like a dream. I reached Aberystwyth at 8:30pm, luckily a B&B that I’ve stayed in a few times before took pity on me and found me a room. So, a happy ending after all. 2 Trusts down 2 left to do.